20 Below, Center and Left Tablet would of been in good condition early in the am yesterday. I hiked the base around 3:00pm and was sprinting to dodge the falling ice. It was all falling apart. The rest of the cliff had only very limited ice up high. With warm temps and rain today and tomorrow it does not look good for any time soon. Since the ice climbing is no good Mopwoers maybe you should come over to Red Rocks. Strange but there is even ice climbing in on Mt Charleston. 01/12/2012 Conditions are pretty sad for January. Extensive Homology- Nope, would be hard to even get there from Glass. Glass- Several good lines on the second pitch, first pitch was much too thin for screws as of 1/11. Can traverse in from 20 Below. 20 Below- Good and fat. LOTS of running water. Besides the tablets probably the only route at the lake that is "in"
Gent- no first pitch and hardly no second pitch on both variations. Prom- curtain does not touch down, really thin below the curtain. Stormy Monday- maybe, looks like it would be difficult. Mindbender area- compared to the rest this are looked good from the road. Renorm looked good, the other two are probably hollow scare fests. thanks for posting David... bummed that things are in such poor shape up there. somewhat surprising too... perhaps this round of snow will help, assuming you get any of it! Everything on the south end is in. The original first pitch to Extensive Homology is even starting to form as of yesterday and thats pretty rare. It is all wet and fairly candled. Most of the Amphitheater routes are climbable but will be thin and difficult, not quite "in" status. With current weather conditions i would consider this report old news even though i was there yesterday. Things are going to radically change on a daily basis with the current weather pattern. Hopefully the next few nights will dip below freezing and some cold weather will move in within a few days. thanks for the heads up David. hopefully you are doing well and things get colder soon. things are looking very good up there. many trade routes are IN at this time. Anyone been there recently? Any thoughts for Weds/ Fri this week? My friend Jim was up there last week and said conditions were decent, he froze his A** off though! I was there on Wednesday and it was good and very cold - never got above 13! It's the same this week! Al. Just read your write up on the lake. awesome as always. Interesting enough I had been to the lake 3 times, shoestring early season and then again the fist day of freeze after a hard thaw, smuggs as well as a few other local spots this year and had not encountered perma pick and foot holds the whole season. Went to Poco on feb 10th and encountered my first gym climb of the season. It is a completly different game. two trips to cathedral and it was the same scenario. The picked out climbs require a completly different mindset of hooking and balanceing to match up with the proper holds. It is fun interesting climbing but worlds apart from climbing natural ice. very very different climbing! the closest thing to the Lake I had done all season was Smear one very cold day. there were no pick or screw holds and it was harder than I had ever done it. way harder than the Dracula walk up. that said, Left Tablet was another couple of clicks harder. the ice was hard, inconsistent and very steep AND we went back and forth between kind of pleasant and full conditions, all in 4 hours. on top of that the top out was awkward and absolutely not a breeze. One thing about the lake that is often misunderstood is that the sun is not always your friend there. the climbs can rapidly turn into verticle slush if the temps even get up to 30F hanging belays melt out before the pitch is finished. It can be pretty serious stuff and lots of visitors seem to simply think its 35 and sunny it going to be hero..... 35f and sunny @ the lake is serious russian roulete.... perfect day @ the lake is 15-25f and sunny or 35 and cloudy. Places in the Gent ampetheather can be terrifying and still be in the upper 20's. mid-March is the time to be up there. cold nights, upper 20's, somewhat sunny days - but not full sun. I've been up there many times when I had to pack slushy ice around the screws to keep them from melting out and could not find good enough ice to use for a v-thread so I had to rap from a single beater 22cm screw while stuff was crashing down on a climb next to us! I'm done up there by the end of March, tho at this rate it may be just a bit later. regardless, I'm heading up there again next Tuesday, weather permitting. there is no place like it other than in the Canadian Rockies. I had forgotten just how great a resource it is, and less than 2 hours form North Conway. Yes is is Awsome Speaking of sandbags. 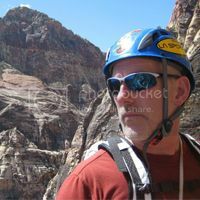 I just read the Ed Webster Description of Repentance rock climb and he has the chockstone @ 5.6!